The father of one of the victims of the Clutha helicopter crash says families have been "punished again" after being asked to contribute to the costs of a fatal accident inquiry. Ian O'Prey's son Mark was among the 10 people who died when the helicopter came down on the Glasgow pub in November 2013. Some legal aid has been granted to relatives of three victims. But they will also have to contribute a combined total of more than £8,000. This is because the legal aid system takes into account the financial position of applicants. Mr O'Prey, from East Kilbride, told BBC Scotland: "My son's been killed and none of us have done anything wrong - where are their priorities? 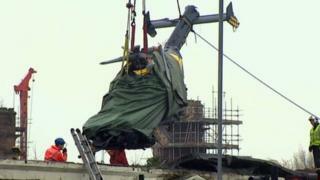 "I've said from day one that the helicopter was more important than the people who died. And I think that will be proved in the length of the time it will take and the amount of time that's allocated into the actual deaths of people. "I think the helicopter is going to be the main part of this FAI inquiry." The Scottish Legal Aid Board said: "Legislation passed by the Scottish Parliament requires contributions to be paid depending on an individual's financial circumstances. Contributions reduce the cost of legal aid to the public purse and so helps fund vital services. "They can be paid in small instalments over a number of years and we will assist anyone who has difficulty paying." The owner of the Clutha bar has set up a second-hand furniture pop-up shop in the southside of Glasgow, in the hope of raising enough to cover the families' contributions. Alan Crossan said: "They are all part of the Clutha, these families. They are part of us and we need to help them. It's not their fees, it's everybody's fees. "Everybody that's involved in the Clutha, everybody that's helped us in the past, what we are trying to do here is give people something back for what they can donate to us." The fatal accident inquiry will start in April and could last as long as six months. Its purpose is to look into the circumstances around what happened at the Clutha bar and to see if any lessons can be learned to prevent anything similar happening again. The inquiry could hear from about 85 Crown witnesses and has a list of 1,400 productions to present. Pilot David Traill, PC Tony Collins and PC Kirsty Nelis died along with seven customers who were in the bar. They were John McGarrigle, Mark O'Prey, Gary Arthur, Colin Gibson, Robert Jenkins, Samuel McGhee and Joe Cusker. As part of the inquiry, the sheriff principal Craig Turnbull has requested to see an operational helicopter configured in the same way as the one involved in the crash. 29 November 2013: Police helicopter crashes on Clutha bar in Glasgow killing 10 people.